Black and white spotty badge with ROCK written in lovely colourful letters. Great badge for any rock chicks or dudes out there. 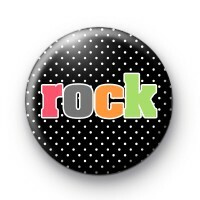 We love heavy rock music here at koolbadges HQ so this is an ideal badge for us.